Moving, tender vocal harmonies on the theme of "No More War" from Helen Yeomans and her "Glorious Chorus" choir. 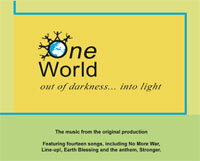 From the album "One World" also available on this site. All proceeds from this sale go to support The Pachamama Alliance.